View More In Jigsaw Puzzles. 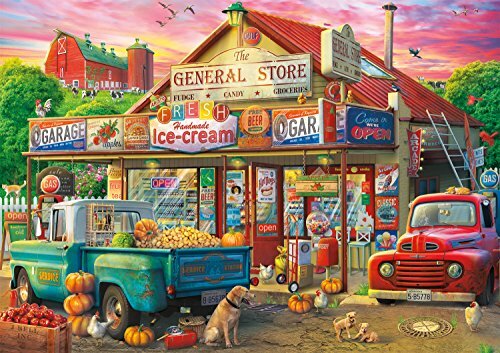 Country Store is a 500-piece jigsaw puzzle and is part of the Americana Collection by Buffalo Games. A collage of colorful signs decorates the front of The General Store as cows roam the green pasture behind it on the farm. A blue and white service station pickup truck sits out front with vegetables and roosters loaded in the back. The General Store sells everything from fudge, candy and ice cream to hot dots and gumballs! Sitting patiently out front is a dog and her puppies as they wait for their owner to go fishing. Every Buffalo Games jigsaw puzzle is manufactured in the U.S.A. from recycled puzzle board. A precision cutting technique guarantees that every piece will fit soundly with the company's signature Perfect Snap. A bonus puzzle poster is also included so that you have a handy reference of what the completed puzzle should look like while you put yours together.